Getting started is half the battle when it comes to building retirement security. Setting near term goals are important too. Here’s how to do both. Financial rules of thumb are just that. If you follow them, you have the satisfaction of knowing that you’ve taken action — but they do not guarantee you’ll get the results you desire. Still, in the savings game guideposts can be especially useful. A near-term target will help you get started, and that’s half the battle. Here is a recently put together, age-based savings guideline with a range of savings goals that can be applicable to anyone. At age 35, you should have saved an amount equal to your annual salary. At age 45, you should have saved three times your annual salary. At 55, you should have five times your salary. When you retire at age 67, you should have eight times your annual pay. You begin saving in a workplace retirement plan, such as a 401(k), at age 25. You save continuously and without interruption until age 67. You start by making an annual salary contribution equal to 6% of pay, and raise the figure by one percentage point each year until you are saving 12% of your pay. Your employer matches you at 50 cents on the dollar up to 6% of your pay and your portfolio grows 5.5% a year. Social Security is factored in. 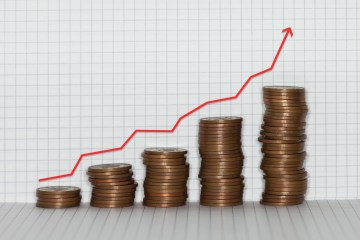 Your income grows 1.5 percentage points faster than inflation each year. These assumptions are reasonable in terms of building an illustrative savings model. But consider that almost no one starts saving at 25 and millions suffer some sort of job interruption over an approximate 42-year career. This model also has you saving 12% of your pay by age 32. A common rule of thumb is 10% and again, most folks don’t get serious about saving until they are in their 40s and 50s. Meanwhile, you will need a healthy slug of stocks to earn 5.5% a year. Yet individuals have been net sellers of stock mutual funds for at least half a decade. Whether Social Security will be available when you retire is an open question. In some cases many people are not earning as much as they used to earn, and not keeping up with the rate of inflation. Of course, it would be a mistake to extrapolate the experience of the crisis years indefinitely into the future. Still, this exercise points up the difficulty of reaching retirement security without an early start, or hyper-aggressive saving at midlife. No matter your age, at least now you can see where you stand – and what to do about it. Contact the First Financial’s Investment and Retirement Center if you would like to set up a no-cost consultation at 732.312.1500 or visit our website for more information. Representatives are registered, securities are sold, and investment advisory services offered through CUNA Brokerage Services, Inc. (CBSI), member FINRA/SIPC, a registered broker/dealer and investment advisor, 2000 Heritage Way, Waverly, Iowa 50677, toll-free 800-369-2862. Nondeposit investment and insurance products are not federally insured, involve investment risk, may lose value and are not obligations of or guaranteed by the financial institution. CBSI is under contract with the financial institution, through the financial services program, to make securities available to members. CUNA Brokerage Services, Inc., is a registered broker/dealer in all fifty states of the United States of America. This entry was posted in Planning for Your Financial Future & Retirement, Saving Money and tagged Investment & Retirement Center, Planning for Your Financial Future & Retirement, Saving Money by M2 The Agency. Bookmark the permalink.